This amazing nickel file can be used wet or dry and is sanitizable. It features an anatomically correct handle and long file head for comfortable filing of natural or artificial nails. 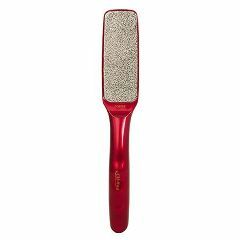 The coarse foot file is for severely callused or cracked heels. Ruby red jewel-tone finish.